UK pump manufacturer Concentric has developed an improved method for sealing pressed steel water pump covers using an advanced, high-temperature anaerobic sealant. 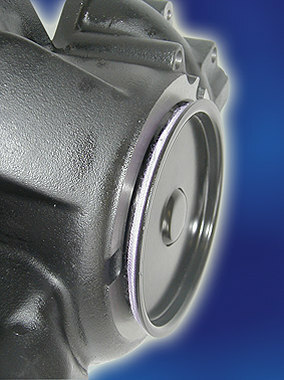 This novel cover design is used in the Perkins 1100 Series six-cylinder diesel engines designed to meet forthcoming EU and North America Stage 2/Tier 2 off-highway emission legislation. The cover is a pressing in the shape of a shallow, rimmed drum, rather like the lid of a paint tin. Before it is press-fitted into the housing, an advanced high-temperature anaerobic sealant is applied in wet form around the rim to close any airways caused by localised creases formed during the pressing operation. The tight fit of the pressing excludes air from the contact area of the two metal closure surfaces and this initiates a rapid sealing process. The result is a permanent, flexible seal which effectively eliminates any possibility of air or water leakage through the pump. The anaerobic sealant has been specially developed by Hylomar of Wigan, UK for Concentric Pumps Ltd. It is one of a range of anaerobic products used for applications such as thread sealing, retaining and gasketing in the automotive industry. Among its advantages is the fact that the sealant can be injected rather than applied as a bead and that it sets so rapidly that the joint can be pressure-tested within minutes. The operating range is from -55ºC to +210ºC and the shear strength of the cured sealant is 35N/mm².